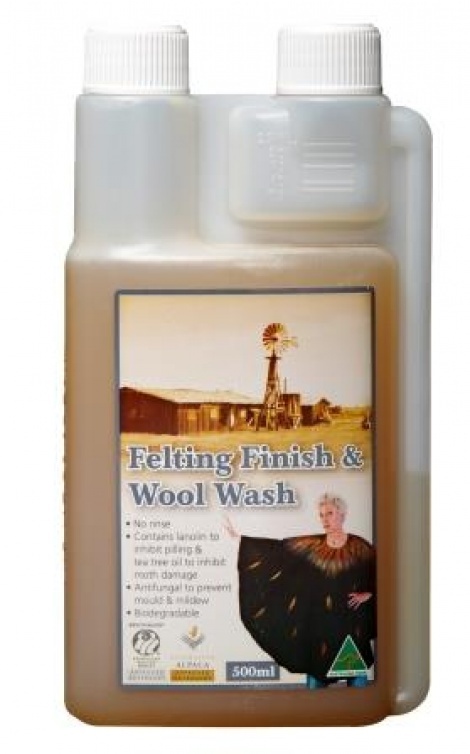 Felting Finish & Wool Wash is a blend of nonionic surfactant and anionic fibre softener and lanolin designed to leave the felting with a soft handle and natural sheen. felting Finish & Wool Wash is designed to be 'no-rinse with the lanolin helping to protect. Woolskin, Delicates Wash, Fibre Scour & Felting Finishing Wash have been tested by Graham Walters & Associates and meet the requirements of Merinomark® and AlpacaMark® and are licenced to carry the Mark. Meeting testing for colour fastness, cleanability & handle.